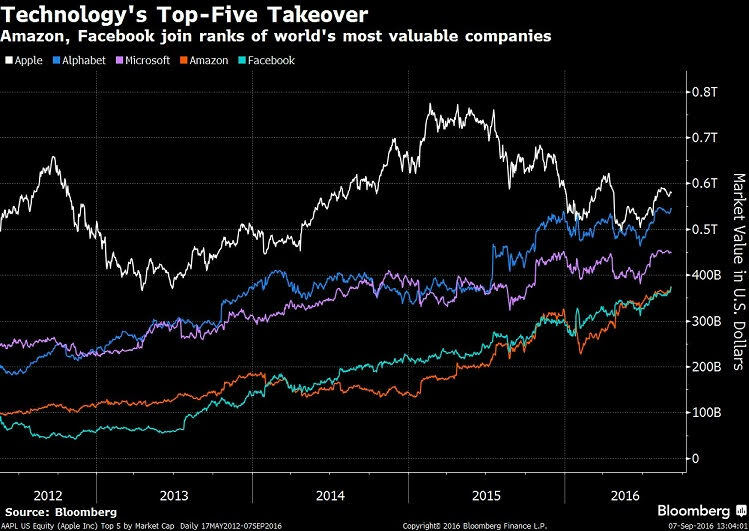 Amazon.com Inc. and Facebook Inc. allowed U.S. technology stocks to claim every place on a list of the world’s five biggest companies by market value, according to data compiled by Bloomberg. The online retailer, which operates a web-services business, and the social-media company were both more valuable on a closing basis than Berkshire Hathaway Inc. and Exxon Mobil Corp. for the first time on Tuesday. Amazon and Facebook joined Apple Inc., Alphabet Inc. and Microsoft Corp. in the top five.